There really is something about little girls, ballet flats & tutus. 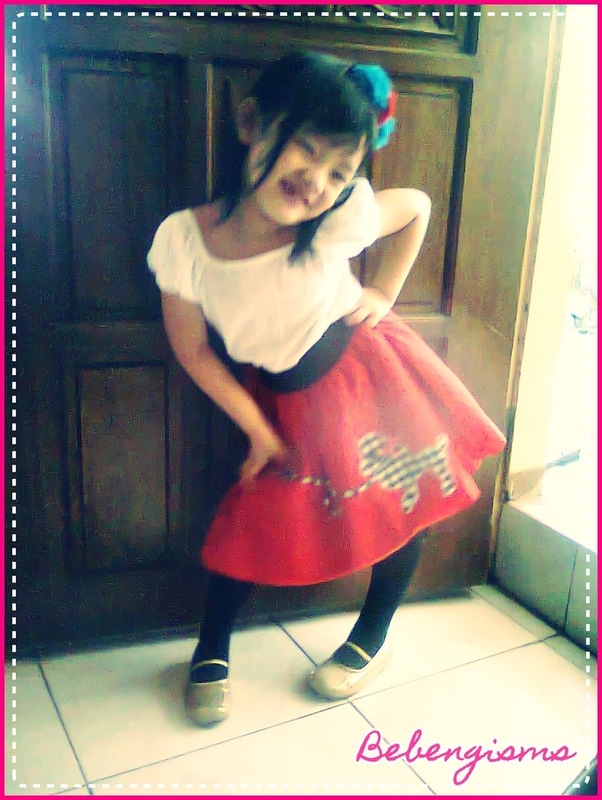 LB (Little Bebeng or Little Ballerina) isn't an exception. She now has 3 tutus in pink, violet & red. Since she was a baby, I like dressing her up. She's my little doll. I didn't care about what other mommies have to say about how I dress her up, it was just a joy to see my tiny fashionista. She was one year old when I made her wore a polo shirt from Baleno & white shorts from Moose Girl. She looked preppy. SIL said "di'ba bawal sa bata ang polo shirt?" Smiling but a bit annoyed, I said "sino nagsabi na bawal?" Maybe she meant that regular babies do not wear such clothes as it might suffocate or irritate them. But my then 11th month old Sophia wasn't complaining. My arms in fan mode were in maximum level, you know. I was ready for some serious sweaty armpit challenge. Haha! I didn't like her top but she chose that. Pretty hairbow from Celestina & Co.
She'll be turning four this month; for a year whenever we dress up, I always have my combative self on as she manipulates her closet and tells me what she wants to wear. Sometimes I let her wear her boyish shirts from Ninang Suzie's travels (SG & Vietnam souvenir shirts). But there are times that I totally disagree with her mix&match of pants & top. Floral & animal-print together?! Imagine my Toni Gonzaga jaw shaking. I get dizzy when we argue so I've learned to choose my battles. Now I have discovered that it's all about mind-set. I lay down her clothes on the bed before bath time so she has something to look forward to. And I sell my styling to her, a la fashion mavens Liz Uy & Jenni Epperson. Like, "nice leggings no? Cyril (her classmate) will really like it, too." There we are, a peaceful mother-daughter tandem. Until, "Sophia, will you stop moving!?" Sigh. Or so I hoped. Fixing her hair is such a big production number. That's another story to tell.